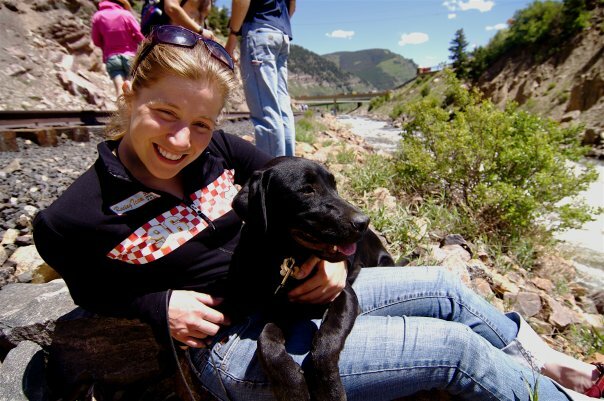 As a whitewater kayaker, I often travelled across the US with fellow paddlers who had dogs. Living off the grid, near whitewater is a lot easier to do with a pet than visiting cities and towns. Sleeping in the back of your van or truck and paddling through the wilderness has created a pet-friendly living environment. 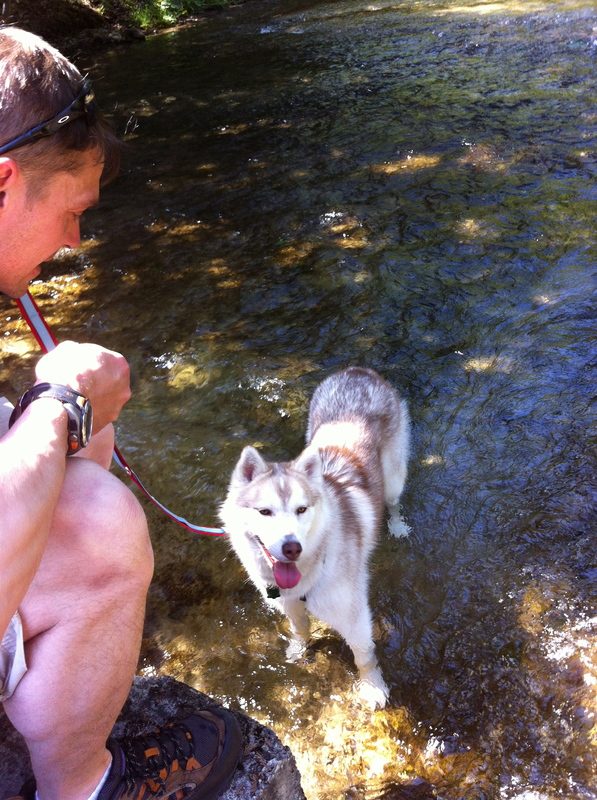 Some rivers, the dogs would follow us along the shore, while others, we left the dogs in the campground or RV. When we discovered that we would be unable to travel for a while due to work and courses, we bit the bullet and adopted a sweet little Siberian Husky named Loki. When Loki was almost a year old, we decided it was time to bring her along on some of our excursions! The May long-weekend was the first test to see how well she could travel with us. I did a lot of research online to see what we could do for one weekend with the dog. My husband was away on a course, so I would be picking him up on the way. We decided that the Bruce Peninsula would be a great option. Hiking, camping and relaxing for a long weekend would work well as a first trip. We didn’t have our camping gear readily available, and since DH was at school, we decided to do it in some form of luxury. We ended up staying at the KOA in Owen Sound, owned and run by a lovely German couple. We rented a small “Kabin” with a double and bunk bed and brought along Loki’s bed and food. Loki made friends with everyone, and we were amazed at how well behaved she was when kids went running past our site or other dogs started barking. Lucky for us, we don’t have a “barker”! Loki resting in the shade after a long hike! There were a lot of sections of the trail nearby for hiking, so we spent our days away from the campsite, exploring nature. 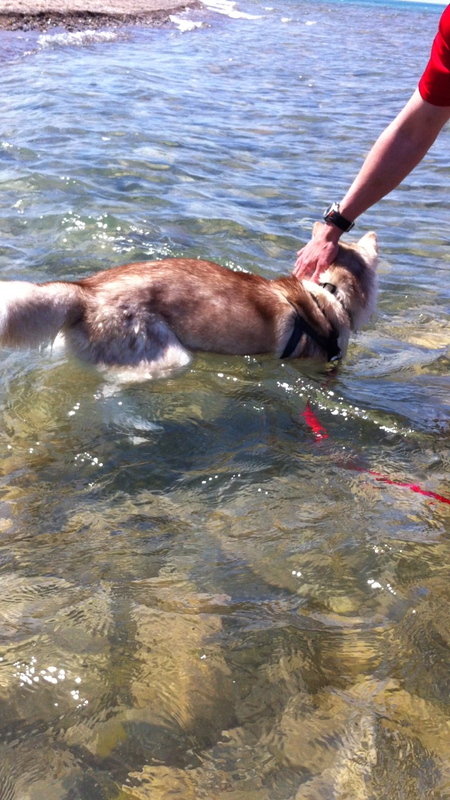 Loki got her first experience with water (she was born in July last year and too young to learn to swim before it got cold); we let her play in a stream, and then on the second day at Kincardine, a dog-friendly beach. The water in Lake Huron was still very cold, so the swimming part would have to wait until later. Loki just didn’t like it at all. Loki playing in the stream. Not liking the cold water so much. We cooked on the firepit in the campground and spent the evenings drinking beer, sitting outside, and chatting with neighbours. The cabins were great for us. Loki’s bed fit nicely in the corner and after each day’s activities, she was out like a light! It was a great first experience travelling with her and now we’ll have to find some other ways to bring her along. Next time, we’d like to do some hiking camping with our tent and sleeping bags and bring the dog along. 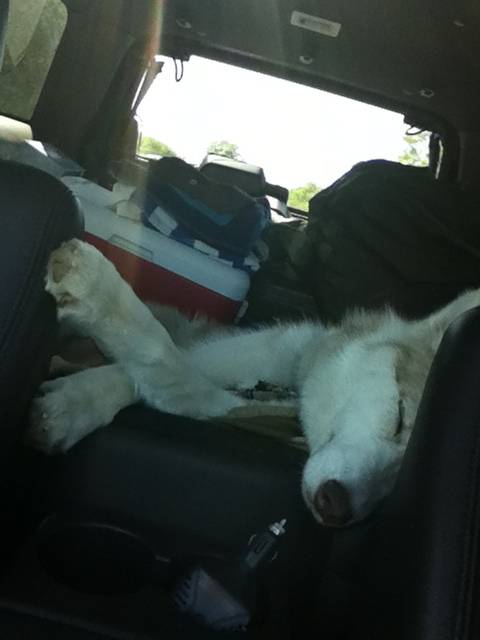 After a full day of hiking, our normally rambunctious Siberian Husky is pretty subdued! We thought about Algonquin Park and do some real hike-camping, but DH is worried about wild animals and how she might fare in a tent. It was a great weekend. We got to spend our time outdoors, and got to bring the dog along. We don’t feel comfortable staying in hotels with a dog, and know that many don’t even allow them to begin with. I think Loki was the most pooped after the whole weekend and she completely crashed on the 6 hour drive back to Ottawa! I hope to do this much more often in the future. It makes for an inexpensive vacation, and the whole family gets to come along! Does anyone have any great resources for travelling with pets? I’ve found a few websites that list “pet-friendly” hotels/motels/parks etc, but I’d be interested in knowing how others fare.